Cover and protect your skin with these comfortable, no-slip sun protection sleeves. 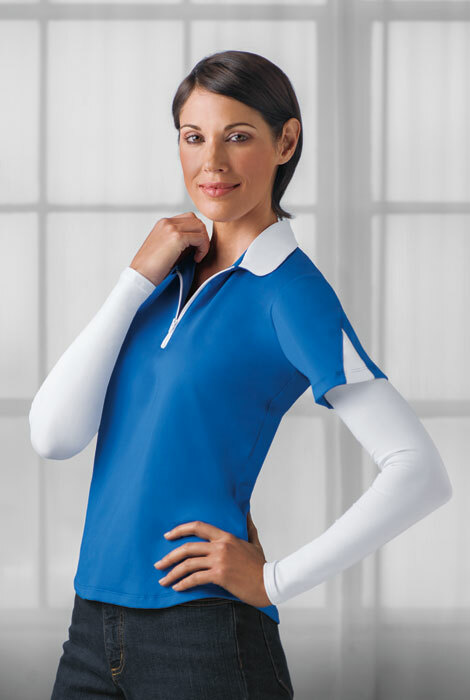 Our UPF 50+ sun sleeves offer the ultimate in sun protection. Just pull them on and you’re ready for a walk or to work in the garden. 88% nylon/12% spandex. Hand wash. USA. S/M, L/XL. L/XL Aqua, SM/MED Aqua are not available at this time. 88% nylon/12% spandex. Hand wash in cold water. Lay flat to dry. Good for yard work to protect from sun damage, and, the reason I got these, was protection for bruises and scrapes on the tender skin of my arms as I have aged, (or maybe medication). I used to cut up knee high socks, but these are sturdier and don't stretch. When I am heading out to weed the garden or take a mid-day walk in the spring/summer, I put these sleeves on for added sun protection. They are great because of how lightweight they are. I don't have to change my clothes and put on a warm long sleeve shirt now! I would recommend these to anyone who is concerned about too much sun exposure. I've only tried it on, but it feels comfortable, and does not look like it will shift too much. Looking forward to wearing it when I play golf. My arms bruise and my skin is so thin it tears with the slightest poke when working in the yard. Sounds like these will protect me. Golfer in the sun and they work. Driving is therapeutic for me. When driving good distances these protect my arms from overexposure to the sun. They are made very well with just the right amount of stretch. They wash very well. I ordered white to attract no extra heat concentration. I also use them sometime when gardening to protect my upper arms. I have been looking for something like this for months--tired of cutting up old trouser socks to slip up on my arms -arms get bruised, cut so easily, especially when working outdoors, etc. I am a regular golfer and these really help in the hot NC sun. For my husband for driving. For sun protection. I have vitiligo and have sun tolerance issues. I chose the Sun Protection sleeves so that I don't have to wear a long-sleeved white shirt in the summer, which can be very hot! Thanks! like to have a sleeve on my arms, something light-weight, even in summertime! Always need sleeves without another shirt underneath, great to find these! To protect my arms from the sun. I have sensitive skin and sunlight causes itchiness so I chose this. I have a lot of sun damage on my arms to hide, and also want to protect them from more sun. I'm a big biker and I start out with sleeves and then remove when it warms up - I am hoping these will be light enough to wear all day long! I have an autoimmune disease and history of melanoma. Both require avoiding sun exposure. Outside a lot & don' t need too much sun on arms. Will you ever be getting the Aqua color sleeves in Small again? BEST ANSWER: Thank you for your question. The Sun Protection Sleeves in the Aqua small has been cancelled and is no longer available. We apologize for any inconvenience. Do these sleeves protect from your skin getting torn or bruised while gardening? BEST ANSWER: Absolutely !! I usually wear these sleeves under a long sleeve shirt - It adds more protection ! Sleeves are good with general "garden nicks and scrapes" . The long sleeves over the gardening sleeves -Keeps the thorns out and keeps from snagging/ and or tearing the long sleeves. I wear the sleeves on my arms when I am driving to protect from sun too ! The sleeves wash well and dry pretty quickly in the ambient air.. Gloves (leather ) for the hands also help to continue the barrier between nature and YOU ! Thank you for your question. The Sun Protection Sleeves are a light weight material designed to prevent sun burns on your skin. They are not designed to prevent cuts or bruises, but to prevent sun burns. We hope this information will be of help to you. I can't say as I have never used them while gardening. I will say that they protect from sunburn, and look attractive with short sleeve tops because they provide the appearance of layering, but are much cooler to wear in warmer temps. What is the length for xl and do they have the thumb slit at the wrist end? BEST ANSWER: Thank you for your question. The large/extra large is 17 3/8" long, the writs opening is 7 1/4" and the top opening is 10". The sleeves do not have slits for the thumb at the wrist. We hope this information will be of help to you. BEST ANSWER: The sleeves stretch so select the size that coordinates with your shirt size. I LOVE THE SLEEVES.